SANTA MONICA, Calif. and BOULDER, Colorado– April 22, 2015 – Seriously, a mobile entertainment start-up, today announced it has partnered with Kidrobot, the premier creator and dealer of limited edition art toys, to develop collectible Best FiendsTM branded vinyl and plush figures. The first slate of vinyl figures will be released at the San Diego Comic-Con. This marks Seriously’s first expansion into consumer products as the company works towards building a global entertainment franchise starting on mobile. To kick off its partnership with Kidrobot, Seriously will release a limited edition run of vinyl collectible Slug characters, that will launch at this year’s San Diego Comic-Con July 9-12. At launch, the Best Fiends mobile game will receive an update – ‘Valley of the Slugs’ – which will feature the limited edition glow in the dark Slugs as well as the introduction of a special Kidrobot fiend in the Best Fiends mobile game. 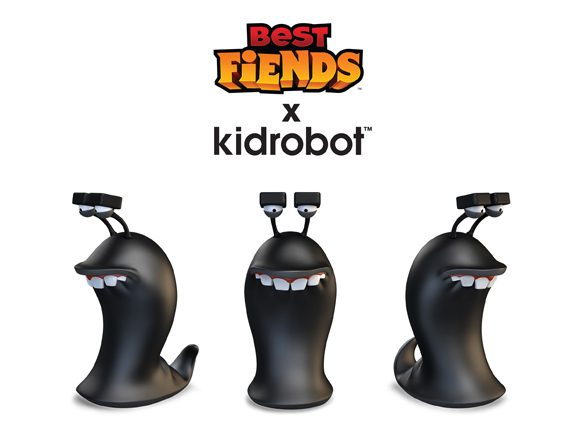 Further Best Fiends collectibles from Kidrobot are slated for later in 2015. “What?…wait a minute I’m about to beat level 123! !,” mumbled Frank Kozik, Creative Director, Kidrobot, amongst a sea of empty slurpee cups and half-eaten sandwiches. Best Fiends features some of the most fun and challenging match and battle levels in an addictive mobile puzzle adventure. Since launch, Best Fiends has been downloaded more than 12,000,000 times with 1.33 million daily active players. The second title in the Best Fiends trilogy will be released later in 2015. Download Best Fiends for iOS, Android and Amazon devices at download.bestfiends.com. Seriously is a mobile-first entertainment start-up focused on building mobile games that are designed to be developed into global entertainment properties. The company’s world-class creative team is passionate about great storytelling, unique characters, dramatic conflict, unlikely heroes and building brands that can make a difference.